Every year at this time, we begin to see atheist groups staging their protests over the placement of nativity scenes and Christmas-related displays on or near public/government property. And this year is no different. Once again, the Freedom From Religion Foundation (FFRF) has placed a sign in the Illinois State Capitol Building that makes their position clear. It is plainly anti-God and "anti-religion", and the FFRF claims the nativity scene in the Capitol Rotunda is unconstitutional and against the Establishment Clause, which provides that "Congress shall make no law respecting an establishment of religion...". They want it known throughout the land that any form of religion at this time of year creates a hostile environment in our culture. Throughout the years that have led to this strategy against Christmas, it has been lost on our society that it is not so much the observance of the holiday that they resist, but the celebration of the birth of our Savior. In essence, it is really an anti-Christ agenda. Because, you see, if Santa Claus, or reindeer, or elves are present in the display, then no problem! (And that is precisely why the nativity scene is allowed in the Capitol Building -- because it is accompanied by the Governor's "Holiday" tree). But a manger with the Savior of the World displayed on its own ... then that is an endorsement [by the State] of religion, and excludes those citizens who do not agree that He should receive the government's seal of approval. It just goes to show you how mixed up this country has become. I guess it shouldn't surprise me that the atheists, humanists, and secularists -- or whatever they want to call themselves -- are offended by the presence of the baby Jesus, yet have no problem with the celebration of Christmas ... as long as it is centered around the pagan roots of the holiday. They will gladly consent to us celebrating a holiday that was hijacked from an early Roman festival; one in which the early Christian author Tertullian claimed, "The pagan Romans clad their door posts with green and branching laurels. In the Saturnalia [the festival worshipping their Sun God], presents come and go. There are gifts and banquets … yet Christians should have no acquaintance with the festivals of the pagans." I understand the origin of our Christmas traditions, and love the lights and decorated trees and the sentimentality of the holiday. But for me, at this stage in my life, I choose to celebrate the real "holy" significance of the "day". Each Christian must decide how they feel about the knowledge of the roots of Christmas for themselves, and how they will celebrate our Savior's birth; it is not something that should divide us. But I do find it curious that the FFRF is so anti-religion. Because the definition of "religion" not only incorporates "the belief in a particular system of faith and worship of a supernatural power, esp. a personal God or gods", but also means "a pursuit or interest to which someone ascribes supreme importance." Certainly, their perpetual hostility and aggression towards Christianity and our expressions of faith qualifies as a religion under that definition. Don't you find it ironic that they are obsessed with denigrating our beliefs, while they promote their Winter Solstice? And while we're using the Constitution as a measuring stick ... they will uphold the Establishment Clause of the First Amendment, yet conveniently ignore the second clause: "Congress shall make no law respecting an establishment of religion, or prohibiting the free exercise thereof." This is called the Free Exercise Clause, and it is time we start exercising it! The Free Exercise Clause guarantees a person the right to practice a religion and propagate it without government interference. This right is a liberty that cannot be deprived without Due Process of Law. And as long as our religious practice does not pose a threat to the health, safety, or welfare of the public, it is permissible by law. But somehow, I guess the FFRF and its adherents think that our belief in God and angels, heaven and hell, is somehow injurious to the general welfare of the public; that it somehow "hardens hearts and enslaves minds." I would submit to you that without Jehovah God and the knowledge of heaven and hell, they become their own gods and the ultimate rulers of their hearts and minds, thus becoming hardened and enslaved to their own selfish thoughts and desires. And most of all, that little baby lying in the manger is a threat to them because we tell them that He is greater than themselves and He is Supreme and Sovereign... something that interferes with their personal profit and pleasure, and most certainly challenges their pride. One of the best explanations I've seen for this hostility towards faith and religion can be summed up by the following: "There is an infinite number of actions, which though punishable by society, may be concealed from men, and which the magistrate cannot punish. In these cases men are restrained by the knowledge that nothing can be hidden from the eyes of a sovereign intelligent Being; that the soul never dies, that there is a state of future rewards and punishments; in fact that the most secret crimes will be punished. True religion then offers succors to the feeble, consolations to the unfortunate, and fills the wicked with dread ... But religion can be useful to man only when it is pure. The Constitution of the United States has, therefore, wisely provided that it should never be united with the state." Well said, and on that point, I can agree! For more information on Religion and the Establishment Clause of the First Amendment, click here. Joshua 24:15 "And if it is evil in your eyes to serve the Lord, choose this day whom you will serve, whether the gods your fathers served in the region beyond the River, or the gods of the Amorites in whose land you dwell. But as for me and my house, we will serve the Lord." Belle, Just look up 'Krampus'. 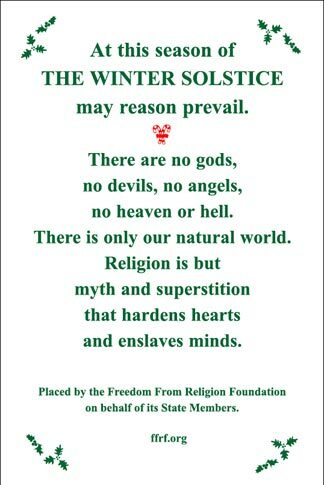 The whole Christ Mass thing is not christian, it is 100% Nimrod/sungod worship to the core. We decorate our churches with commemoration to the greatest antichrist figure since Satan himself. The church leadership will never hold on this point as it would wreck their beloved 501-c3. This is sungod worship rolled into a nice cozy mega church entertainment theme. The game is up and the church leadership is corrupted in so many ways. I like what you wrote but Im afraid this will fall on deaf ears. Yes, it will, and I must admit that the quarrel between Christians on this matter is not at the top of my priority list this year. I will fight endlessly for the right to put a manger in the public square -- I will not abandon my worship of the Christ child -- but, In the past 12 months, God has shown me that there is such evil and turbulent spiritual warfare coming upon the Church and that is where my energy needs to be. I choose to celebrate the birth of my Savior (even while knowing that December 25th is Nimrod's birthday and not Yeshua's), because every day is worthy of celebrating God's incarnate presence on the earth. December 25th has no spiritual meaning to me, (however, the Lord's feasts have GREAT meaning to me!) and I do not engage in Santa Claus worship, but no longer am willing to cause dissension among my fellow Christians if they choose to put up Christmas trees. While we are arguing over the pagan roots of Christmas (and I totally recognize that it IS pagan! ), the dark entities are running amok and Christians have no clue that they are about to enter into the biggest spiritual battle of their lives. We need to ignore the commercialization of Christmas and celebrate our Lord in our own way, and strive to focus on the coming battle!